"Everything you do, do it with passion, energy, and enthusiasm." 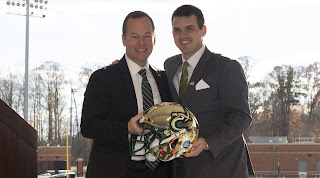 Will Healy, the new head football coach of the Charlotte 49ers, is driven by those 10 words. His teams are driven by the same philosophy, which leans heavily on character, relationships, and positivity. "Will Healy reflects our program and institution," Hill said. "He is a young, hungry, up and comer. He is a force to be reckoned with." 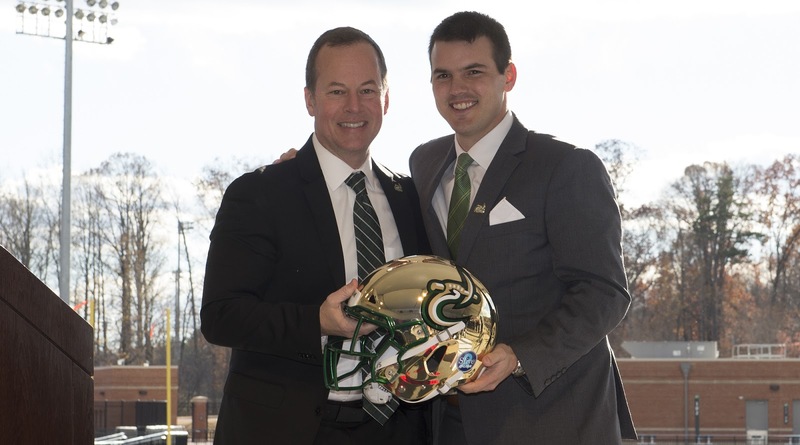 "We're delighted to attract a coach of Will Healy's caliber and character," UNC Charlotte Chancellor Philip Dubois said. "We've got a gold mine here. I love what we're going to do here together. Let's build something special," Healy told the standing room only crowd. "The people in the city of Charlotte need to come see what this place is about. People are going to come here because they know us and because of the relationships that our players and our coaches and our athletic department have with them. We are going to build a family atmosphere. We believe in who we are, we believe in how we are raising a culture and how we are raising these men to be great husbands and fathers. We believe in the opportunity that comes with being a student-athlete here at Charlotte and I can't wait to go along this journey with all of you in this room." When he said he told Hill "I would walk to Charlotte from Chattanooga to have an opportunity to talk about this job", you believed he would. That attitude helped him land top-five FCS recruiting classes at two schools in four of the last five years, including the top recruiting class in the FCS following a 0-11 season. "We used ... multiple conversations with fellow colleagues across the country, administrators, coaches, and others," Hill said "Will Healy's name continued to pop up over and over. There is high praise for this man, not only as a football coach but as a human being. He made an impact obviously recruiting and as a coordinator. He's clearly a rising star as we talked to everyone around the country. There were four characteristics we were looking for in our new head coach. High character and integrity, proven recruiter, teacher and developer of talent, and who values culture." And now he's the coach charged with lifting Charlotte's young, energetic and enthusiastic football program to greater heights. "This place is special. We get the chance to build our own history, our own story," Healy remarked. "We want fans screaming about Charlotte Athletics, that's my vision for this place. I feel like I'm living a dream. I always felt this job can be one of the top programs in college football. I think when you drive on this campus for the first time you get a chance to see the facilities and the resources this place has to offer - this place is really special. My family and I are really living a dream being here."